Reading 1: Ex. 16. 1-5, 9-15; Gospel: Mt. 13. 1-9. The Gospel of today is the passage which has been read and reflected many a times. There have been many dramas and stories on this parable. 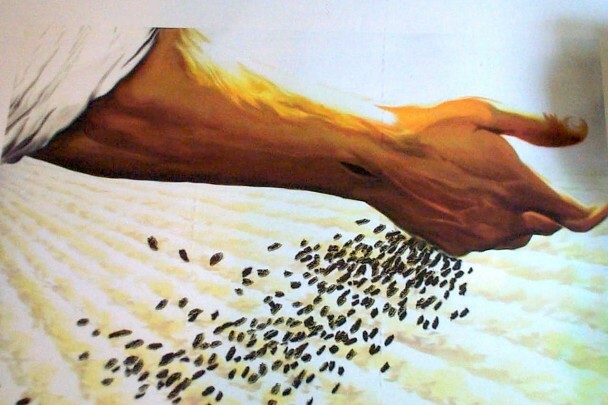 Parable of the Sower brings to us many reflections, especially with regard to the seed which represents the word of God. but, I need ponder upon the verse “A sower went out to sow”. There is nothing new or spectacular in this statement. It is the duty of the sower to sow, and he did his duty. I would like to further deal with the preparation one needs to do before sowing the seed. In order to sow we need to have the seeds. We collect seeds with a plan of gaining a good crop. To sow the word of God for which we are called for we need to collect or possess the word of God in our hearts. We need to sow this life giving word of God with our hearts not with our brain. Sowing with brain will not bring any fruits but sowing with hearts will bring forth hundred fold. Secondly preparing the place, unless and until the farmer prepares the place for sowing the seed his work will be in vain. We need to prepare our hearts to receive the word of God and allow it take root in us. the new will be able to sow the word of God in the hearts of others. Mary our mother has shown us a great example and model in receiving and giving the word of God that is Jesus to the world. She conceived the word of God first in her heart then in her womb. Let us be like apostles and saints prepare our hearts to sow the word of God and become a farm house of the word of God where people can experience the power of life giving word. Excellent service of the Word of God. Congratulations for making His Word alive. May His Kingdom come.